Gunman opens fire on house of worship on the Jewish sabbath, killing 11 and injuring six. A man is in custody after opening fire Saturday at a Pittsburgh synagogue, killing at least 11 people and injuring others -- including four police officers -- in what authorities are calling a "hate crime." 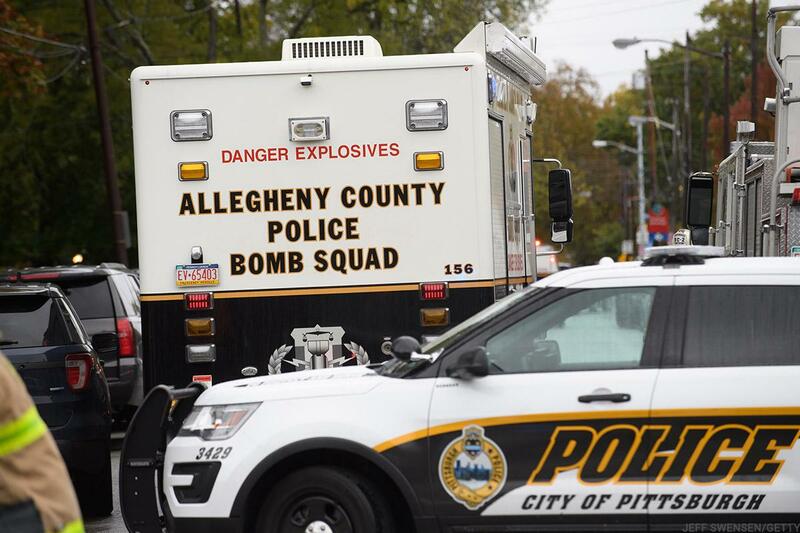 The shooting broke out at about 10 a.m. Eastern on Saturday -- the Jewish sabbath -- at the Tree of Life Synagogue in Pittsburgh's Squirrel Hill neighborhood. A total of 11 were killed and six were injured, Wendell D. Hissrich, Pittsburgh's public safety director, said at a 4:10 p.m. press conference. Four police officers and two others were among those injured. No children were harmed. Authorities identified the suspect as Robert Bowers, 46. The FBI said they had no prior contact with Bowers, who was injured in a struggle with police. He is in "fair" condition with gunshot wounds, said Hissrich. Bowers shouted "All Jews must die" before storming the synagogue, reported CBS Pittsburgh affiliate KDKA, which said police had cordoned off Bowers' residence. Bowers later surrendered to police and SWAT officers, according to the news team, which also said the man opposed what he thought was a Jewish effort to help immigrants come to the U.S. According to a report from CNN citing a law enforcement official familiar with the investigation, Bowers has an active gun license and made at least six firearm purchases since 1996. CNN also reported that on Sept. 29, Bowers posted photos of his handgun collection online, and that FBI officials said a rifle and three handguns were found on the scene of the attack. An area hospital, UPMC Presbyterian, confirmed Saturday afternoon that it was treating four of the synagogue shooting victims and that three were undergoing surgery. An additional patient was also treated at UPMC Presbyterian and had already been released. Most of those in surgery and care were older adults and some were in critical condition. 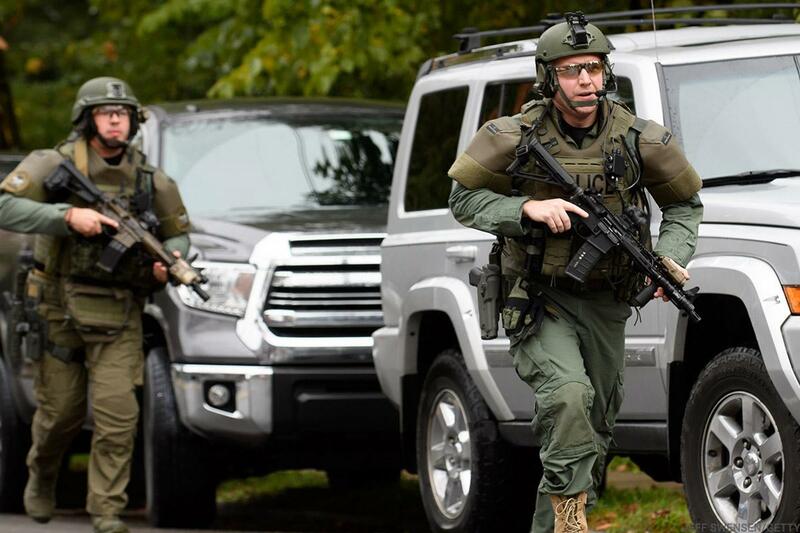 Heavily armed police were on the scene at a Pittsburgh synagogue where multiple people were apparently shot. Calling the shooting a "hate crime" during a press conference earlier in the day, Hissrich choked up while discussing what he called the worst crime scene he's ever witnessed. Pennsylvania Gov. Tom Wolf called the shooting "an absolute tragedy. These senseless acts of violence are not who we are as Americans." Similarly, Pennsylvania Attorney General Josh Shapiro called the killings an "assault on the liberties our country and Commonwealth were founded to protect." Trump told reporters before a speech in Indiana that "we just don't seem to learn from the past" and that "there must be no tolerance for antisemitism in America." Earlier in the day, the president said that "one thing we should do is stiffen up laws in terms of the death penalty. When people do this, they should get the death penalty and shouldn't have to wait years and years [for their court appeals to run out]." But when asked whether the shooting would change his views on gun laws, Trump replied: "this has little to do with it if you take a look." He said that if the synagogue had had an armed guard, "they would have been able to stop [the shooter]. Maybe there would have been nobody killed except for him, frankly." Saturday evening, U.S. Attorney General Jeff Sessions issued a statement declaring "the Department of Justice will file hate crimes and other criminal charges against the defendant, including charges that could lead to the death penalty." Ironically, Jeffrey Myers, the synagogue's rabbi, expressed his concerns about mass shootings in a July blog post on the congregation's website. Talking about the Parkland, Fla., shoot shooting earlier this year, Myers appeared to criticize Republicans' generally pro-gun-rights stance and worried about his own family's safety. "Now that schools are closed for the summer, apparently school safety is not important, as shooters are finding other valuable sites," he wrote. "Despite continuous calls for sensible gun control and mental health care, our elected leaders in Washington knew that it would fade away in time. Unless there is a dramatic turnaround in the mid-term elections, I fear that that the status quo will remain unchanged, and school shootings will resume. I shouldn't have to include in my daily morning prayers that God should watch over my wife and daughter, both teachers, and keep them safe. Where are our leaders?" The country bomb squad was at the scene. It's not yet known whether Myers was injured or killed in the shooting. But in a blog post just three days ago entitled "A Little Bit of Joy," the rabbi wrote about the importance of participating in happy events like birthdays rather than just sad ones like funerals. "Every birthday celebration unobserved is one less opportunity [for happiness]," he wrote. "You can respond with, 'Oh well, there is always next year.' [But] none of us can say with certainty that there is always next year." Pittsburgh's Sixth Presbyterian Church was holding a community interfaith prayer vigil Saturday evening.